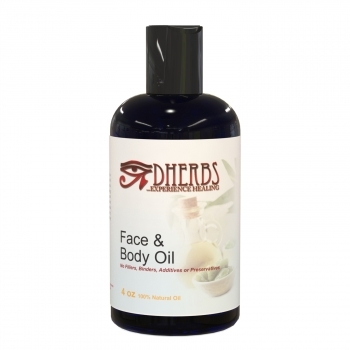 Face and Body Oil is a moisturizing and penetrating oil comprised of natural botanical oils with nourishing and rejuvenating properties. It helps to soothe your dry skin. The oil also supports regeneration of skin cells, promotes elasticity, regulates oil production, and helps to maintain healthy looking skin. 4 FL OZ. Directions: Pour a small amount of oil into palm of hand and rub together and rub or massage into problem area of skin. Use daily if necessary (skin disorder) or as needed.